It has been a year of celebration. A party year. But as I looked down the list of festivities planned for 2012, I could not help noticing a gap. So surprising was this gap that I assumed I must have missed something. Perhaps I was on the wrong mailing list? Surely somebody, somewhere, was celebrating the 500th anniversary of the Sistine ceiling? Michelangelo’s masterpiece is either the most famous painting in the world or, if the Mona Lisa out-dips it at the line, the second most famous. Everybody knows it, even those who do not know they know it. That ubiquitous image from its centre of the fingers of God and Adam nearly touching pops up once a week in some context or other. I’ve seen it on aprons, underpants and football programmes. When an artwork is as famous as this you expect all its birthdays to be celebrated noisily. Let alone it’s half-millennium. 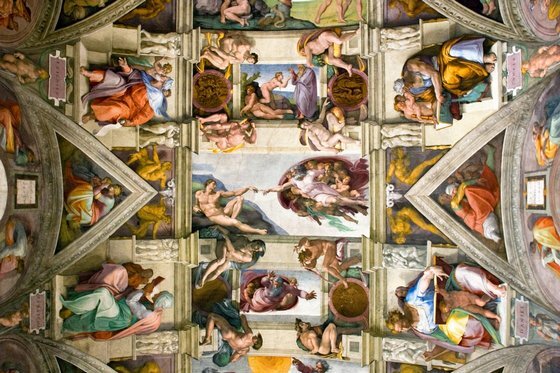 Why hasn’t the Vatican summoned us to Rome for a huge set of Sistine parties? Why isn’t Simon Schama on the telly every night babbling on about Michelangelo? Why aren’t the shelves of my local Waterstones sagging from Sistine link-ups? Five hundred years ago, Michelangelo completed the greatest feat of painting our civilisation has witnessed. Yet apart from the small celebration we are having here, between ourselves, nobody seems to have noticed. The Vatican is, of course, a law unto itself. If the Vatican is keeping quiet about the Sistine Chapel for its own reasons, those reasons will never be shared. The fact is, we actually know remarkably little about the first or second most famous painting in the world. Fundamental questions concerning its meaning have never been answered. What is actually represented on the chapel roof? Why was Michelangelo commissioned to represent it? Modern art history has been no help. Obsessed with Michelangelo’s homosexuality and the classical influences at work on his musculatures, the art history of today is entirely useless when it comes to the key issue here: the Sistine ceiling’s Catholic message. If the Vatican really is keeping something from us, modern art history would never know it. My own fascination with the darker mysteries of the Sistine ceiling began 30 years ago, when I was allowed to visit the Vatican while the fresco was being restored. It is one thing to admire Michelangelo’s achievements from the ground, 70ft below, and another to press your nose against their surfaces and smell the presence of their creator. From this close you can see the smudges of his thumb and count the hairs from his brushes embedded in the paint. As chance would have it, they were restoring the ceiling’s most famous bit, the fingers of God and Adam. At some point in the fresco’s past, the fingers that Michelangelo painted had fallen off. So the ones you see now, the famous ones, are the work of a restorer. But what really surprised me up there was the terror. From down below, looking up, it is already clear that something very troubling is being depicted on the Sistine ceiling. Look at the expression on the face of the prophet Jonah as he leans back in his stone throne. It’s as if he’s being attacked by a Tyrannosaurus Rex. Or what about the beautiful Delphic Sybil? Why is she so haunted? From the ground, these celebrated fortune-tellers merely appear anxious. From close up they are monumentally petrified. And they are not alone. The naked chaps sitting about the roof are also terrified. The ancestors of Christ are terrified. The little angels buzzing from prophet to prophet are terrified. Eve is terrified. The Almighty himself, in the scene where he is creating the sun and the moon, looks angry enough to explode. Even to a godless age like ours, surely it is unmissable that something biblically momentous is being depicted on the Sistine ceiling? Another thing I could not work out and which has never been satisfactorily explained is the behaviour of Julius II, the crazy pope who commissioned Michelangelo. Even by the crackpot standards of the papacy, Julius was unbalanced. They called him Il Terrible — the Terrible Thing. One of his first acts upon being elected to the papacy was to knock down St Peter’s. It was the most important church in Christendom, and had stood for the best part of a millennium, but Julius decided to build himself a new one: the St Peter’s we see in the Vatican today. He was the only pontiff ever to lead the Vatican army into battle. In a thoroughly foolhardy and historically unique display of papal arrogance, he actually donned armour and rode into Northern Italy at the head of his Vatican soldiers to recapture the large swathes of papal land lost to assorted invaders. There have been crazy popes before. Lots of them. There have been arrogant popes before. But no pope was ever as crazily arrogant as Julius II. The things he did require a special kind of arrogance: a Messiah complex. I don’t know if you know that absurd film The Agony and the Ecstasy, in which Charlton Heston plays Michelangelo and Rex Harrison plays Julius II, and the two of them bicker endlessly over what Michelangelo wants to paint on the Sistine ceiling? Of course, it would never have happened that way. No Renaissance pope would have given any Renaissance artist an empty slate and told them to fill it. Particularly not Julius II. Michelangelo would have been told exactly what the Pope wanted from him. A precise iconographic scheme would have been drawn up beforehand. The painting of the Sistine ceiling would have followed a masterplan approved by Julius II. So if Julius II believed himself to be a Messiah, the evidence would be in the Sistine masterplan. And it is. Astonishingly, nobody ever seems to have discerned a unifying thread to Michelangelo’s imagery. The individual scenes painted on the ceiling have been endlessly discussed — the Creation of the World; the Birth of Adam; the Sin of Eve — but why they are all shown together and what they mean as a whole has never been answered. I suspect that is because people no longer know their Bibles well enough; particularly art historians. The dark and intense Catholicism that shaped Michelangelo’s masterpiece is Catholicism of a particularly dangerous kind. As you enter the Sistine Chapel through what would once have been its main doors — these days the huge Vatican crowds are channelled in from the other side — you pass beneath two critical images. The agenda setters of the space. The gate-keepers. One is an enormous coat of arms showing an oak tree with spreading branches. Julius II’s family name was della Rovere, which means “of the Oak”. It was his uncle’s name as well. This uncle, Sixtus IV, was the pope who actually built the Sistine Chapel. Sixtus was a spectacular nepotist, notorious for looking after the interests of the della Rovere family. It was Sixtus’s machinations that brought Julius into the Vatican. There are oaks all over the Sistine Chapel. Oaks, branches, trees, a black forest of painted sign language. Directly above the huge coat of arms is the first of the famous ring of prophets painted on the ceiling by Michelangelo. We might have expected to see Isaiah here, or Jonah, or Jeremiah, or any of the prophetic big guns. Instead we get Zechariah, one of the so-called minor prophets of the Bible. Unlike the more celebrated harbingers of doom arranged on the further walls, Zechariah is hardly ever painted. Yet here, he sits above the entrance door in the most loaded position in the entire chapel. Zechariah may not have much of a history in painting but he is by no means a negligible figure in the story of Christianity. By my reckoning, he could well be the most dangerous prophet of them all. I first realised how dangerous Zechariah was on April 19, 1993, when President Clinton sent an army of FBI agents armed with tanks into a compound in Waco, Texas, where a renegade Christian cult called the Branch Davidians had been stockpiling a mass of firearms. The Branch Davidians were waiting for the end of the world. Clinton and the FBI hurried up the process by killing 81 of them in the raid, including 24 British citizens: voyaging Davidians from Brixton. The Branch Davidians knew all about Zechariah. He was the reason they existed. The biblical book of Zechariah, which the prophet can be seen reading in Michelangelo’s depiction of him above the door to the Sistine Chapel, is one of Christianity’s most worrying texts. It contains two fundamental prophecies. One foretells the coming of a mysterious Messiah who will rebuild the church. The other predicts and describes the end of the world. In Zechariah, these two biblical foretellings are fatefully intertwined. The Branch Davidians owed their origins to Zechariah. They called themselves Branch Davidians because, according to Zechariah, chapter 6, verse 12, an angel of the Lord appeared before the prophet accompanied by a man “whose name is The Branch”. The Branch, prophesied Zechariah, “shall build the temple of the Lord”. He shall “be a priest upon his throne” and he shall “sit and rule upon his throne”. It’s a famous messianic prophesy. The leader of the Branch Davidians in Waco, David Koresh, believed it referred to him. He was not alone. I think Julius II believed himself to be The Branch, too. The Branch fantasy depends on consulting the correct edition of the Bible. The Bibles used by the Branch Davidians, the Bibles scattered about their hopeless little chapel in Waco, were copies of the King James: the great English edition from 1611 whose birthday you may remember we celebrated last year with, yes, a big party. But when Michelangelo painted the Sistine ceiling the only Bible freely available to most congregations was the so-called Vulgate. The Vulgate was supposedly translated into Latin from the original Hebrew by St Jerome in the 4th century. It remained the only readily available biblical text for the next millennium. However, if you turn to Zechariah 6:12 in the Vulgate, you read that this same Messiah figure who would “rebuild the temple of the Lord” is now called “The Orient”. It’s very confusing. Until the Renaissance he was The Orient. After the Renaissance he became The Branch. The information must have hit the della Rovere family with the force of a revelation. I first came across The Orient in Dante’s famous Paradiso, in the cantos about St Francis of Assisi. Dante was a fervent Franciscan supporter. The monks of Assisi still quote him today, on a large plaque embedded in the walls of their spectacular headquarters, high above the valley of the Topino river. If you look up from the bottom of the valley, the sun seems actually to be rising from the great Franciscan hill. According to Dante: “From this slope, a Sun was born into this world. Whoever speaks of that place, let him not say Ascesi, I have ascended, which is inadequate, but Orient, if he wants to name it correctly.” Apologies for the clumsy translation. The pun on Assisi or Ascesi only makes sense in old Italian. What Dante is saying is that the rightful name of this place where the sun was born into the world is not Assisi, but Orient. In the many fresco cycles illustrating the life of St Francis, notably in Giotto’s painting inside the basilica of St Francis in Assisi, the saint is invariably shown rebuilding the church: often literally, with the building itself wobbling on his shoulder. This is not the place to go into the extraordinary messianic history of the Franciscans. Neither are they the only ones who believed the church would be rebuilt by The Orient. Our old friends the Freemasons, those secretive rebuilders of the temple beloved of Dan Brownists everywhere, found their inspiration in the same Vulgate translation of Zechariah. They even inherited its weird grammar. The oldest masonic organisation in Europe is the Grand Orient de France. Julius II was a Franciscan. They all were. His nepotistic uncle, Sixtus IV, was another. Before he was chosen as pope in the most surprising papal conclave in history, Sixtus was a humble theologian called Francesco della Rovere who the other cardinals believed would confine himself to the quiet pursuit of learning. That is why they selected him. Instead, the first della Rovere pope surprised them all by taking to the papacy like a man possessed. It was Sixtus who appointed the Spanish Inquisition. One of his first acts as pope was to launch a crusade against the Turks. In Rome he restored or rebuilt 30 churches, and founded seven new ones. The quiet theologian had a Mr Hyde in him. By the time Sixtus became pope it was possible to learn from various sources that Jerome had mistranslated Zechariah’s messianic prophesy, and that the man who would rebuild the church was not The Orient after all, but The Branch. The Hebrew word, tsemach, was understood correctly by the great Franciscan scholar Nicholas de Lyre, whose commentaries on the Bible were published in Rome in 1471 — the year Sixtus IV became pope. Indeed, the de Lyra edition is actually dedicated to Sixtus and his family. When Giuliano della Rovere was elected pope as Julius II in 1503, it would only just have become clear that The Orient was in fact The Branch. But what about Zechariah’s second momentous prophesy: that the arrival of The Branch would trigger a countdown to the end of the world? How is that reflected on the Sistine ceiling? Reader, it is everywhere. The entire room, the whole chapel is set at the moment of doom. Up in the clouds, the history of man’s creation and sin is flashing past us, as histories do at the last moment. Down below, the ancestors of Christ are shuddering because Zechariah had predicted that the House of David will be torn apart: “every family apart, and their wives apart”. The prophets are shuddering because their parents are about to kill them: “And it shall come to pass that, when any shall yet prophesy, then his father and his mother that begat him shall thrust him through.” The entire Sistine Chapel is shuddering because the end has begun, and the end begins with an earthquake. Of course, I could be imagining all this. Perhaps the placing of the della Rovere oak directly under Zechariah is just a coincidence. Perhaps the frightened expressions on the faces of the prophets has nothing to do with a dangerous prophesy. Perhaps the only reason why the Vatican is not celebrating the 500th anniversary of the Sistine ceiling is because the chapel gets enough visitors already and does not need the extra attention. Perhaps.